CUDA Fortran for Scientists and Engineers shows how high-performance application developers can leverage the power of GPUs using Fortran, the familiar language of scientific computing and supercomputer performance benchmarking. The authors presume no prior parallel computing experience, and cover the basics along with best practices for efficient GPU computing using CUDA Fortran. 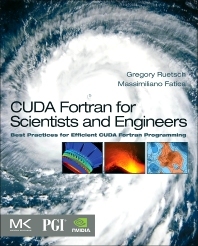 To help you add CUDA Fortran to existing Fortran codes, the book explains how to understand the target GPU architecture, identify computationally intensive parts of the code, and modify the code to manage the data and parallelism and optimize performance. All of this is done in Fortran, without having to rewrite in another language. Each concept is illustrated with actual examples so you can immediately evaluate the performance of your code in comparison. Professional scientists and engineers whose research codes are in Fortran; students studying parallel programming using Fortran. Massimiliano Fatica is the manager of the Tesla HPC Group at NVIDIA where he works in the area of GPU computing (high-performance computing and clusters). He holds a laurea in Aeronautical Engineering and a Phd in Theoretical and Applied Mechanics from the University of Rome “La Sapienza”. Prior to joining NVIDIA, he was a research staff member at Stanford University where he worked at the Center for Turbulence Research and Center for Integrated Turbulent Simulations on applications for the Stanford Streaming Supercomputer. A very easy to read and useful book.